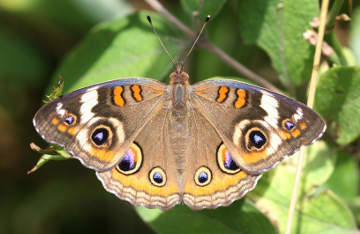 The common buckeye is a medium-sized butterfly with a 2-inch wingspan. Have you seen this colorful butterfly, the common buckeye? So far it’s been a pretty good year for buckeyes. Late summer is a good time to see one. Recognize common buckeyes (Junonia coenia) by the large eyespots that give them their name and by their orange markings on a tan background. Keep your eye out for them in open areas such as fields, meadows, powerline cuts, gardens, roadsides, or other disturbed areas. You’ll often find these butterflies in a somewhat dry environment with patches of bare ground, where they like to rest with their wings open. Look for them on the ground. Common buckeyes are travelers. We think of monarch butterflies (Danaus plexippus) as migrating to Mexico in the fall and returning to our area (over several generations) in the spring, but some other butterflies also make north-south migrations. The common buckeye is one, although its journey is less dramatic than the monarch’s. Common buckeyes can’t survive our New England winters in any form – egg, caterpillar, pupa, or adult butterfly – but in the spring between May and July some buckeyes migrate northward from southern states where they do live year-round. Some years are better than others, with more buckeyes arriving here. They find mates, lay eggs, and die. During the summer, the next generation hatches and eats and grows as buckeye caterpillars, which become pupae and transform into butterflies. This new generation of buckeyes (or a second new generation) then starts migrating southward as fall approaches. While migrating, buckeyes often follow coastlines or rivers. What plants do they seek out as host plants for their eggs and caterpillars? You might want to know this if you have a butterfly garden, or even if you’re just hoping to spot a buckeye. They use several native plants, including gerardias and vervains. But they’re adaptable and now also use certain non-native plants such as narrow-leaved plantain (Plantago lanceolata), a widespread, low-growing weed of fields, lawns, and disturbed places. Buckeyes take nectar from many different summer wildflowers, so watch for them at patches of wild blossoms. What good are the buckeye’s large eyespots? Aside from helping buckeyes recognize one another, the eyespots give these butterflies some protection from predators, especially birds. When a buckeye opens its wings, flashing the eyespots, a pursuing bird can be briefly put off the chase by the eyespots, which look like they belong to some scary creature. Or, if the predator has been focusing on the butterfly’s colorful pattern, the butterfly can suddenly seem to disappear when it closes its wings, showing the drab undersides. And as the buckeye quickly flutters away, it may seem to appear and disappear, as the colorful top side of its wings alternates with the drab underside. Try watching a buckeye in flight if you want to see how well this works. As summer winds down, enjoy looking for buckeyes. They might be harder to find here next year.